The pig that wanted to sway like the daisies. Here’s a little fable and illustration I created for children :). 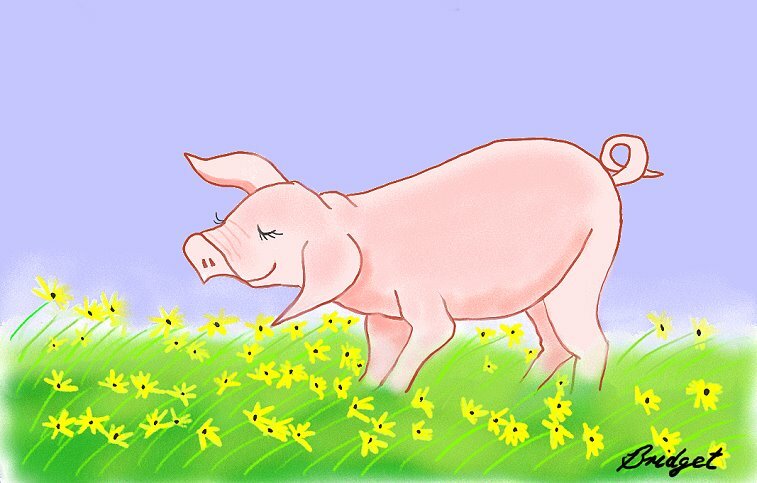 A pig one day, came across a field of daisies that were waving in the wind. He enjoyed watching the way they swayed back and forth, back and forth and hoped that he could too, sway gently like them in the breeze. He stood in the middle of the field and asked the wind to blow stronger for him, so that he may sway like the daisies. The wind heard his plea, and began to blow with gentle wisps. The pig could feel the wind against his body, but alas nothing happened. The wind took a deep breath and blew out an enormous tornado. The pig felt the wind come, and began to move at last, and move he did, for he was caught up in the funnel of wind and was swept away to another land. When he finally landed, he lay still in a field of gently swaying daisies. Moral: Accept yourself for who and what you are. Accept others as they are. * I wrote this article, as many people have come to me feeling guilty and feeling confused as to why they are mistreated. This is only a spiritual (universal laws) explanation, as much overt injustice has more to do with social stratification and pedagogy. It would be nice to see a world without the need to control others, where we can be free to be ourselves naturally without power games :). Reincarnation is a doctrine of Eastern Religions and was once part of the Judeo-Christian doctrines, prior to its removal by Church leaders. There were many references to reincarnation, astrology and the law of karma until the Church removed these excerpts at various stages in the past. Two such instances were the council of Trent in 300 A.D. followed closely behind by the Council of Constantinople in 553 A.D, aided by Emperor Justinian and Empress Theodora, who insisted that all references to these concepts be removed from the Holy works, and the Pope acquiesced. They did this because they believed that if people knew that they had the power to control their own destinies and that the unfolding of their lessons occurred over many live times, then the Church leaders would not have much control, if any, over their flock. This understanding of reincarnation suits a mind that is accustomed to time in the 3rd dimension, that understands time as a sequential event where one moment to the next moment creates the future moment that is ongoing, and where the past is something that has gone before.. I prefer to understand reincarnation from a perspective that allows for parallel universes or existences to overlap, in other words- worlds within worlds within worlds. For instance, we can dream of a future existence, and call it a premonition, or deja vous. The soul has prepared the person for a particular experience by giving a dream sequence of details, images, feelings, thoughts and words, not unlike watching a movie prior to the actual experience. Now during the experience we call it a deja vous moment or upon the instantaneous recollection of the event, a premonition. How is it then that our dreaming self has forseen the events before the event has occurred? The only logical explanation is that our soul lives out various existences on different planes of existences in different time zones. Our soul can maneouver between the past, present and future, and it can even travel to other time zones and worlds. It is timeless… It is in actuality a multidimensional light being with incredible powers, and as it is the intrinsic life force of us human beings, we ourselves are really powerful beings. Considering that we understand time in its linear format in this dimension, I will describe reincarnation from the perspective of past lives and/or ancestral body/mind memories. All of us on our journeys to wholeness, need to learn specific things or lessons in order to grow. We also need to let go of any hindrances which may block our true expression. You see in this world there are many illusions which give us pain and suffering. It is part of the plan to force us to live a dualistic experience where we feel separated by God/Goddess, and to anchor us firmly in the density of matter. It is by reintegrating ourselves at soul, mind, emotional and physical levels that we grow and advance the collective consciousness of the universe and ourselves. We grow together! At a soul level we are perfect, and archetypically we dream of our own perfection. However imbued as we are in physical vehicle we have limitations. One of our main purposes in life is to move on from our limitations by releasing the old more restrictive perspectives/patterns that hinder our progress and embrace a larger and more unlimited viewpoints. This is why it is best to see life as a game, and not to take it too seriously! :). As none of us on Earth are perfect, we all have aspects of ourselves in denial at various levels of our beings. Psychology calls it the shadow, and from a reincarnation perspective, these are soul fragments which have not yet reintegrated themselves into the present moment. These denied aspects of ourselves can be repressed emotions from this life also, or they can be ‘carry-overs’ from previous existences, or be part of a familial karmic pattern. In other words we get stuck in time, so to speak, until we recognise these aspects and reintegrate them into the present moment. Karma is often thought of as “an eye for an eye and a tooth for a tooth”. This is simplistic and doesn’t take into account the complex processes involved in human growth and evolution. “As you sow, so shall you reap,” encompasses the meaning of karma better, but this doesn’t really do justice to the complexity of this law. There are two misunderstandings that contribute to the confusion about karma; that we are born bad and that we must be punished for our sins. Both beliefs are related to the Fall of Mankind in the Garden of Eden Myth, which forms the basis of Judeo-Christian thought. The concept that God punishes us, is a childish conception of God. God does not want to punish us or hurt us, for he loves us. 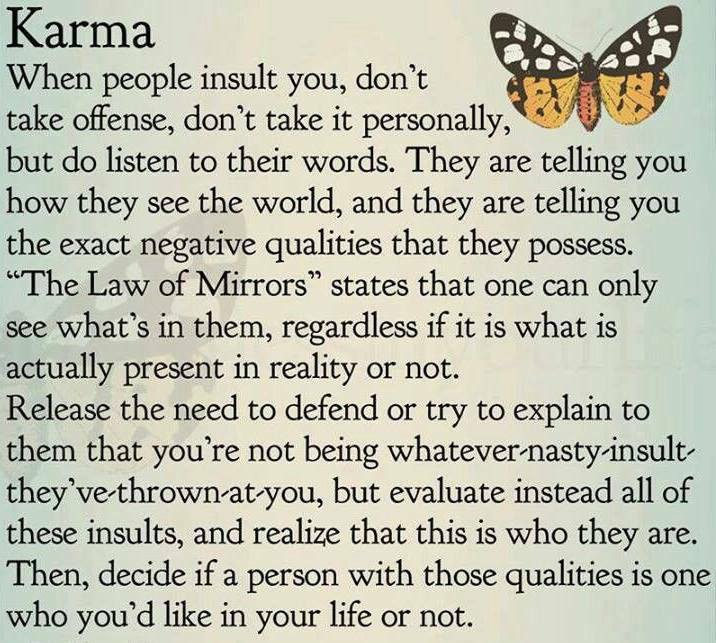 Karma is a natural law of the universe and a tool for the evolution of humanity. It is governed by love, as is all life, and it cannot be born of retribution and punishment. As beings of free will, the choice of working through Karma is decided by each and every living soul, as a lesson we choose to GET better with during this incarnation. We all have karmic gifts as well as karmic debts. Karmic gifts are those talents and skills and good deeds that we have done in the past in which we are rewarded in the present. If for instance we have a gift for music, then this gift is a product of the work we put into developing our musical talents in the past. We don’t graduate into a virtuoso in only one lifetime! Examples of this can be seen in history from the likes of Mozart, Bach and Beethoven just to name a few. These individuals were composing beautiful music before they learned to read! And, there are times when others do us favors and good deeds without our understanding why they did them for us. These types of bonuses that drop out of the blue, are repayments for for our giving and good deeds in the past. Karmic debts are those lessons and repayments that need to be made to others which originated from choices that we made in the past that caused serious injury, pain or death. Since balancing a karmic debt involves learning as well as making amends to the victim, the individual is often put in a position of role reversal so that they may understand what it is like to walk in others’ shoes so to speak, and gain the necessary empathy and understanding needed to prevent a similar tragedy from occuring. If someone steals from you, you can be sure that you’ve stolen from someone in a prior existence. If you receive kindness, compassion, financial aid, or any other apparently undeserved favor from someone in this life, its not undeserved at all! You can be sure that you performed the same service for that person in a previous incarnation, and he or she is magnetised by karmic law to return it now. Jesus said, “do good unto all those who hate you and say all manner of evil against you.. and if a man strikes you on your cheek, turn and give him your other cheek”. In other words, pay your karmic debts gracefully, without complaining, without bitterness or resentment, and the karmic burden will be lifted from you, provided your graceful acceptance is balanced with a positive act that will balance any former negativity. First accept, then forgive, and then atone. Become at one with yourself in the moment. These are the keys to heal our pasts. We can not heal by continually rehashing our pasts! Consequently, through the process of karma, we are given lessons and challenges to overcome, so that we may have more moments of embracing the moment in its entirety. When we do this we live in the ‘sunshine of our soul’ and have moments of cosmic consciousness, as we bathe in the love and light of our soul presence which is connected directly with God/Goddess/Universal Energy. It is up to each and every one of us to make positive changes, to grow and to love. For, if we truly love than we can understand, and through understanding we gain compassion and understanding of others, and it is love that gives us the impetus and passion to fulfill goals for the betterment of ourselves and humanity. And this is where karma comes into the equation, for to understand karma we must accept the universal unfolding of life, and learn to make the right choices to bring more love and happiness into the world and to leave behind the scars of yesteryear. dig deep down within, and grab your lion’s heart. dig deep down within, and grab you’re lion’s ruff. dig deep down within and your lion will give you plenty. dig deep down within, ‘cause your lion won’t fall. dig deep down within, and make your lion friend live. then grab on tight to his mane, and you’ll find it can be done. For the lion is not scary, he’s your friend, not your foe. 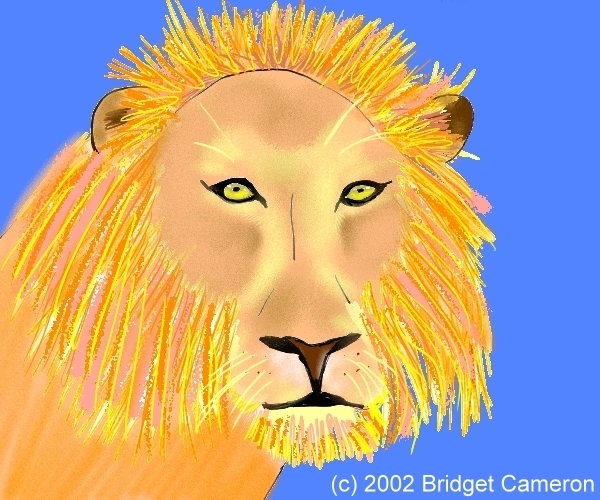 And, if you have any doubts, just let your lion show. so do yourself a favour, just grab your lion’s heart!